What it doesn’t tell you is that it’s a piece of marketing. What I haven’t told you is that all surveys are a piece of marketing. Let’s put some measurement on this. Vicki Morwitz from the Stern School, New York, and Gavan Fitzsimons of the Wharton School, Pennsylvania, conducted some fascinating work on the mere measurement effect in the late 2000s. Equally fascinating is their use of a dataset 40,000 respondents long. Morwitz and Fitzsimons asked of people something simple – the strength of their desire to buy a car in the next six months. It is truly, because simply asking about the strength of desire – Morwitz and Fitzsimons found – disproportionately increased action.The actual rates of car purchase among the group in the following six months of the study shot up to over 35% above average. That’s not supposed to happen for a survey; changing behaviour? Why are we so odd? So how exactly does ‘somewhat likely’ mean a lot more likely? 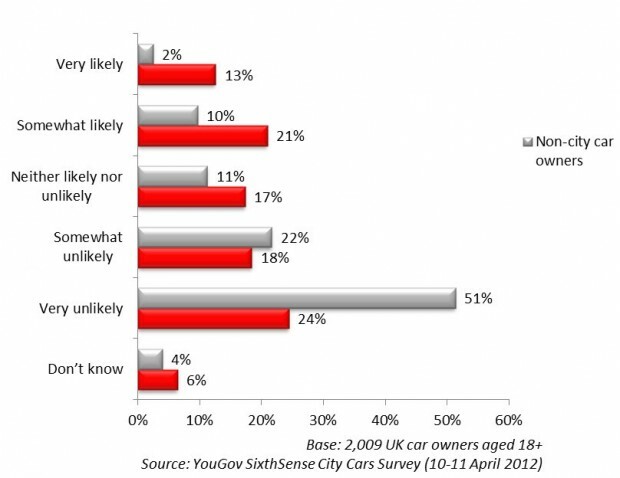 In the YouGov graph (shown) SixthSense commissioned a survey drawing on a sample of over 2,000 UK adults (aged 18+) who own a car and used it mainly for personal use. One of the questions they asked was how likely consumers who own a city car are to buy another city car at this moment in time and how likely consumers are to buy a car within the next two years. It is clear from the Morwitz and Fitzsimons study that those with an existing attitude get lit up like a Christmas tree – and in this instance the self-reporting ‘somewhat likely’ and ‘very likely’ responses clearly have an existing attitude, and so are the ones that conform to our understanding of the mere measurement effect. Not only opinion asked, but attitude enhanced. And if we do a direct read-across from Morwitz and Fitzsimons’ mere measurement effect experiment, a 35% uplift in purchase.